Are you able to perform an invasive procedure? ⦁ Invasive species may start off making headlines, but often level off in a few years. ⦁ The brown marmorated stink bug is an invasive species that can upset customers and frustrate technicians. As front-line combatants in the war against pests, we’re chronically labeled as killers of the natural fauna. Truthfully, almost every significant urban pest is an introduced species, and we’re Anakin Skywalker* bringing balance to the force. Of the major urban pests, only Eastern subterranean termites (Reticulitermes flavipes) and carpenter ants (Camponotus spp.) are native species. All others are interlopers. House mice; Norway and roof rats; pavement and pharaoh ants; German, American and Oriental cockroaches; bed bugs; Indianmeal moths and dozens more are introduced species. If an introduced species thrives and has a significantly negative effect on the environment, on an indigenous species or the human population, it’s considered invasive. Honey bees are a deliberately introduced species that achieves pest status occasionally, but they are not invasive. When a species becomes invasive, it is usually because of a lack of natural predators or other controlling factors that exist in their home range. Invasive species start strong, but often find their equilibrium over time. This will happen when the controlling factors catch up with them. They start like a conquering hoard that seems unstoppable, but within a few years, they’re facing the same types of challenges all the native species face. 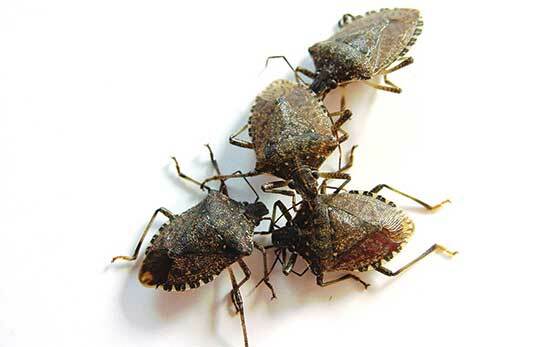 If you thought the multicolored Asian lady beetle (Harmonia axyridis) was bad, and it is, wait until you get a load of the brown marmorated stink bug. Introduced to the mid-Atlantic states in the mid-1990s, Halyomorpha halys can not only ruin a crop, but has actually driven growers out of business. They feed on a large number of fruits and vegetables and can generate numbers so high that little can be done. When the season is over and the crops are ruined, the bugs head for the nearest building to overwinter. At more than 0.5 in. long and nearly as wide, their large relative size and staggering numbers can cause most homeowners to repent right there on the spot. Unfortunately, by the time a pest management professional (PMP) receives the call, there’s little that can be done. The best thing to do is seal the building against insect invasions before the stink bugs arrive. At the time of the frantic phone call, with thousands of “icky bugs” flying around and crawling all over the house, the best you can do is make an exterior perimeter treatment. Even the most amazing products will do no more than kill the bugs once they get a lethal dose. This results in thousands of bugs flying around, crawling all over the house and writhing on the ground as they die. This is hardly what the homeowners meant when they asked whether you could do something. They are usually hoping for something a bit more miraculous. As invasives go, the brown marmorated stink bug seems pretty typical. It made front page news in the mid-Atlantic states a few years ago when it was full bore, but it has quieted somewhat and is working its way west. Yet it still has the potential to cause serious harm to fruit growers and capture headlines.